Part of the iEntry Network over 4 million subscribers. 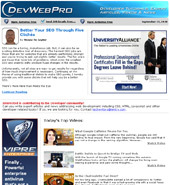 DevWebPro Send me relevant info on products and services. NOTHING CONNECTS PEOPLE TO A MESSAGE AS QUICKLY AS VIDEO. StreamSend Private Label offers agencies and resellers the ability to fully white label our powerful email marketing and behavioral automation platform. It is an easy way to diversify your portfolio and provide your clients with an additional product under your brand, boosting your bottom line.